The Yankee Candle website provides you with the option to either check out as a guest, or to create a registered account with our site. 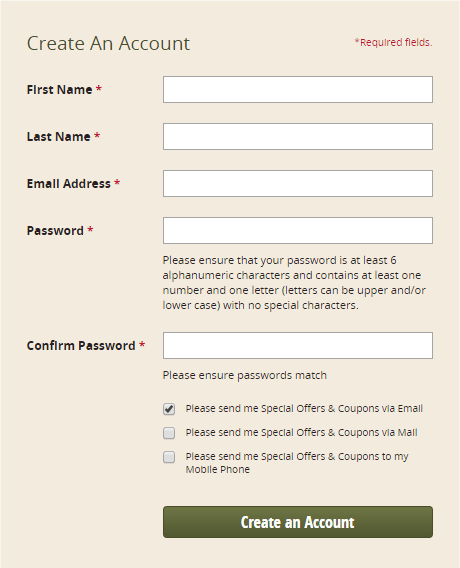 What are the advantages of creating a Yankee Candle account? Easily save your credit card payment method for convenient access on future orders. Use this feature to automatically complete your shipping and payment information. Review & Submit Order is your next step—very convenient for quick checkout or when you’re ordering from a tablet or smart phone. Save your gift recipients’ addresses or alternate shipping addresses for your own orders. Items will remain in your shopping bag for 30 days and will appear when you are logged into your account. You’ll also receive email reminders of what’s in your cart so you won’t forget to place your order. If you’re logged into your account when you add something to your Shopping Bag, you’ll automatically receive an email reminder of what’s in your cart. Save a list of products you’re interested in to create your own personal shopping list or to share with friends by email or social media. Log into your account to access your saved addresses, payment methods, shopping bag or wish list from any of your devices—smart phone, desktop computer, laptop or tablet. When you’re logged into your account, you’ll be able to see your Order History. It shows the items you ordered, billing address, payment method, and tracking number, as well as any return order details, if applicable. The tracking number is valid for 30 days, and orders will remain in your Order History for six months. Your account allows you to share your opinions about our products. We always love to hear from our customers and look forward to hearing from you. Easily manage your contact preferences in your main profile. You can elect to receive these offers via email, by physical mail or to your smart phone. Step One: Select the “Account Sign In / Register” link, found on the upper right section of the page. Step Two: In the “Create An Account” section of the Registration page, enter your first name, last name, email address, and create a password for your new account. 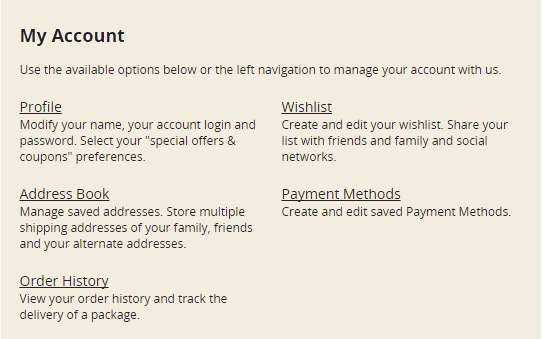 After you create your account, use your “My Account” center to enter your payment method(s), addresses for your address book, and Wishlist.